The gravity field on the surface of the Earth is not uniformly the same everywhere. It varies with the distribution of the mass materials below. This lateral change can be measured and interpreted in terms of likely causative geology. A Gravity survey is an indirect (surface) means of calculating the density property of subsurface materials. The higher the gravity values, the denser the rock beneath. Gravitation is the force of attraction between two bodies, your own and the Earth for example. The strength of this attraction depends on the mass of the two bodies and the distance between them. A mass falls to the ground with increasing velocity. The rate of increase is called gravitational acceleration or g for gravity. The unit of gravity is the Gal (in honor of Galileo). One Gal equals 1 cm/sec2. Various rock types within a study area often contrast enough in density to cause gravity anomalies. The specific gravity of earth materials varies from 1.2-1.5 for unconsolidated alluvium; 2.5-3.5 for hard igneous or metamorphic rocks; to 3-5 for massive metallic minerals. A void has a density of zero, but if filled with water or mud, the density will be about 1-1.5. The specific gravity of water is 1.0. Specialized gravity meters are used to measure the effects that comprise the Earth’s gravity field. For near-surface investigations, the working surface on which the measurement is made is also important. The elevation of the measurement point must be known, or first determined, to better than 2 centimeters. Crew size is usually small. However, much effort is spent in measuring the elevations to the required precision. Thus several persons may be required during much of the field work. 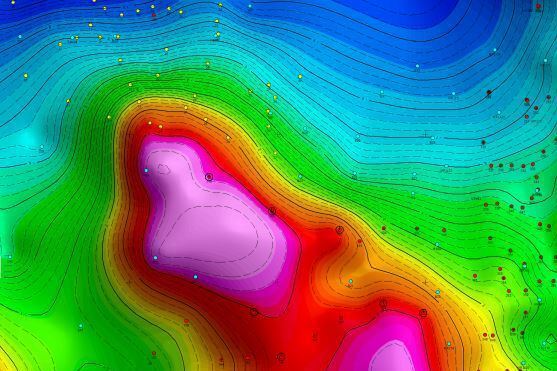 The gravity geophysical survey method involves making several mathematical corrections to the measured data to correct for: the elevation of the measurement point, the spatial location of the instrument with respect to the earth, the density of the surface material, the tides, and the surrounding topography, all of which require expertise and specialized processing of the gravity data. Overly optimistic impressions about the precision of the reading (some manufacturers sell instruments with a one microgal graduation on its dial) and the size of the expected response from the target, are potential misunderstandings in the use of the gravity method. Plan maps of station locations, contour maps of reduced gravity values, residual-anomaly separation maps, final anomaly maps, and an inversion of the anomaly values (based on an assumed or measured density contrast) to a causative geologic body.